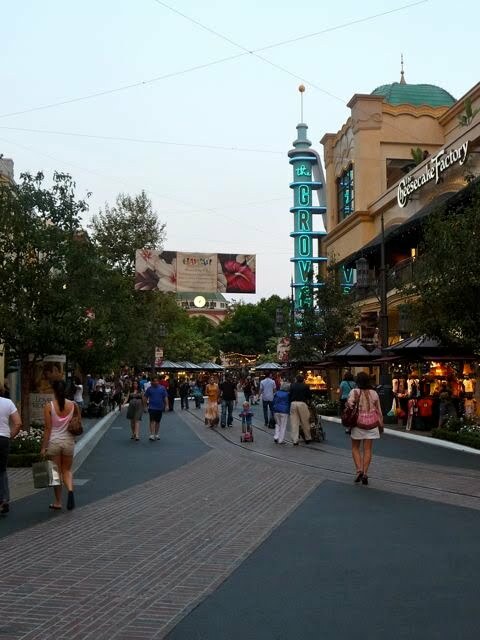 The Grove is a relatively new outdoor shopping center located in the Fairfax District of Los Angeles. 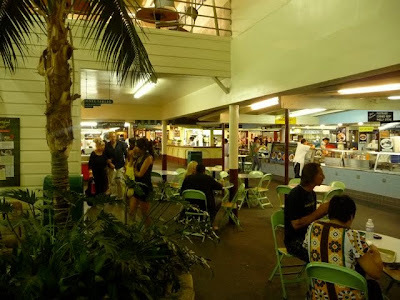 It consists of a large outdoor plaza and a "two block" faux street, terminating at the much older Farmers Market complex (more on Farmers Market in a minute). 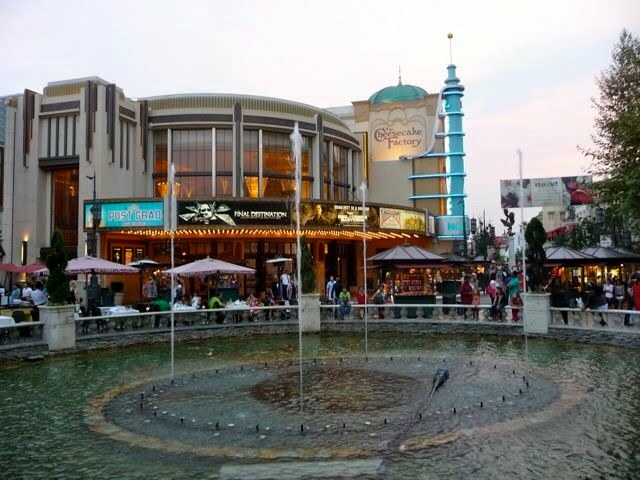 The central plaza features a small park and animated fountain, performing a choreographed musical show every 30 minutes, with a non-musical program in between shows. Definitely a crowd pleaser. 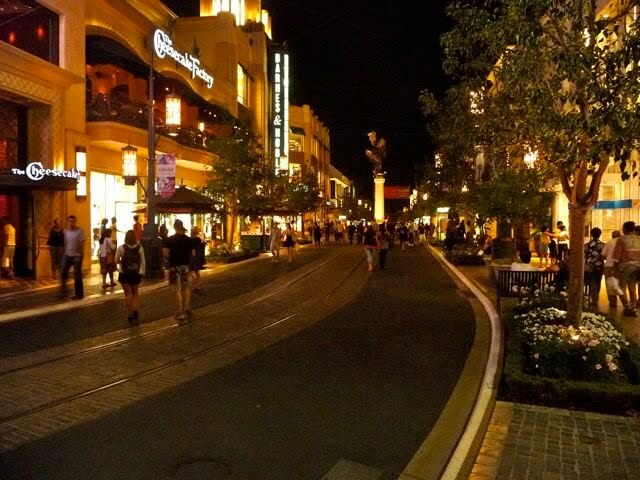 You'll find the usual suspects at The Grove: a large multiplex movie theater, the Cheesecake Factory, Banana Republic, Barnes and Noble, Crate and Barrel, Nordstrom . . . really, stuff you can find in almost any major U.S. city. 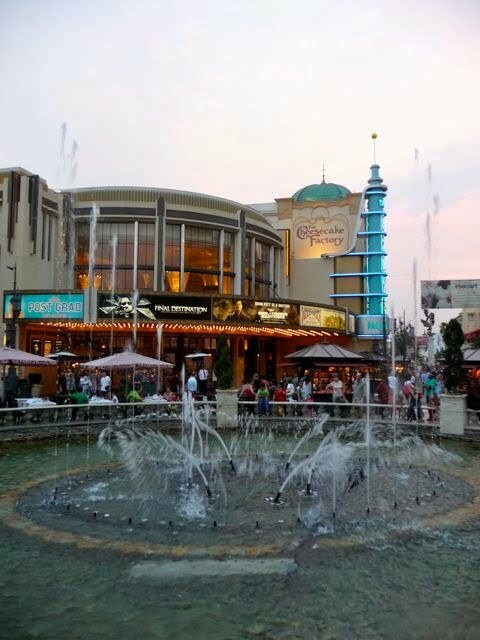 What's unique is the atmosphere: a completely outdoor setting, interesting storefronts, the plaza with it's park and entertaining fountain. There's even a free (yes, free) double decker electric trolley that runs up and down the street during the day. The Grove is a nice enough shopping center, but despite all the bells and whistles, what I like best about it is how it's given new life to the adjacent, and much older, Farmers Market complex. 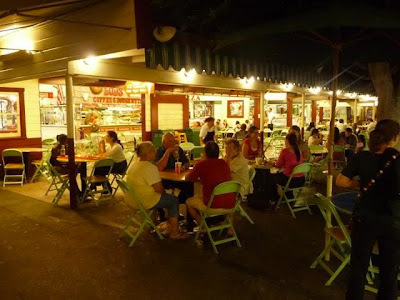 Farmers Market consists of a series of permanent food stands and restaurants. 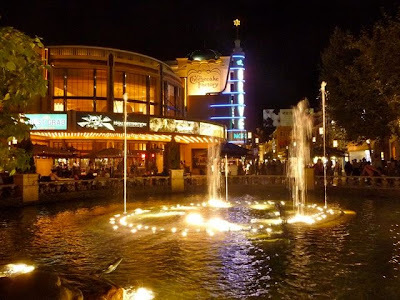 It opened in July of 1934 and recently celebrated their 75th anniversary. There's pretty much something for everybody. Our family likes the French crepe place and they've got a great selection dried fruit. OK, that's pretty random. But I like dried fruit. I've jokingly called Farmers Market "the Olvera Street for white people" (please don't take this in any way as a racist remark). There's actually some similarity between them, and they opened four years apart: Olvera Street, 1930 - Farmers Market, 1934. As a kid, I remember my grandfather taking me to Farmers Market. For his generation, it was a big deal and still a draw. To me, I didn't get the appeal - I just liked driving over and spending time with my my grandfather. In 1990 I stopped by Farmers Market with my now wife (we weren't married at the time). To be honest, Farmers was looking a little ragged around the edges. It was kind of sad. Fast forward to 2002. 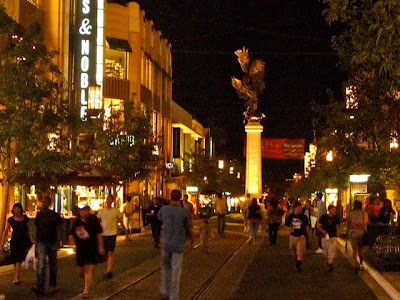 We were back and town and decided to take our kids to see what The Grove was all about. Developer Rick Caruso had just opened it up that Spring and honestly did a great job tying the two complexes together. Retail and entertainment at The Grove, food next door at Farmers Market. 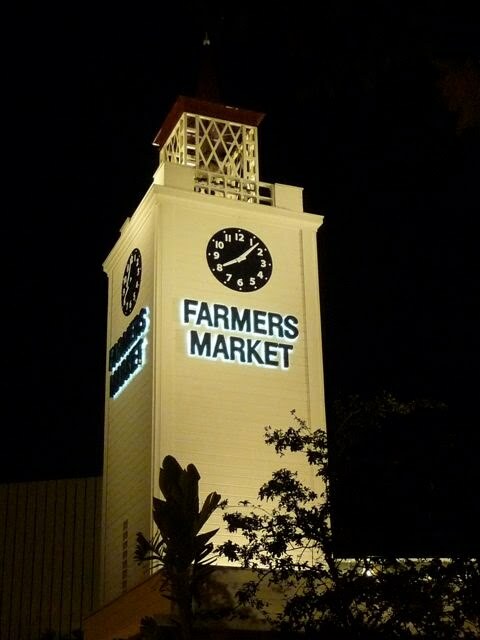 Did The Grove "save" Farmers Market? I have no idea . . . but based on what I had seen years earlier, I'd say yes. I wonder if fifty or sixty years from now, old-timers will be talking about how great The Grove used to be . . . and community activists will be talking about what it'll take to "save" it . . .
Is it worth making a special trip to The Grove? Maybe. Depends where you're coming from. These pictures were all take a couple of summers ago. My wife and I had dinner a mile away in "Little Ethiopia" http://www.experiencingla.com/2009/09/little-ethiopia.html and so we were in the area. 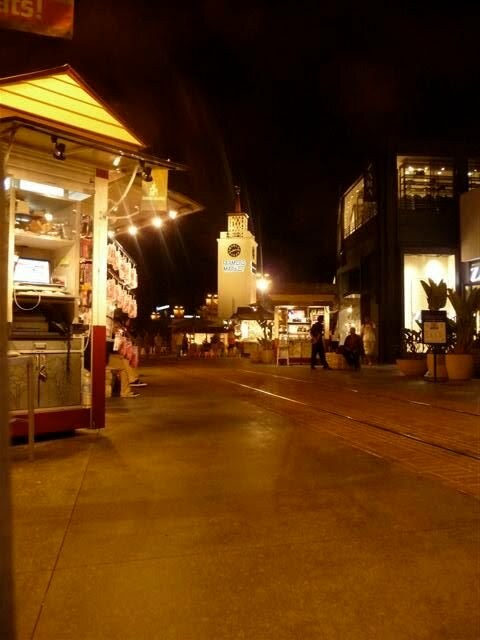 To me, The Grove is fine, but the real treat is always Farmers Market. "The new" is fine, but there's something special and unique about "the old." And, this being Los Angeles, 75+ years is considered ancient. 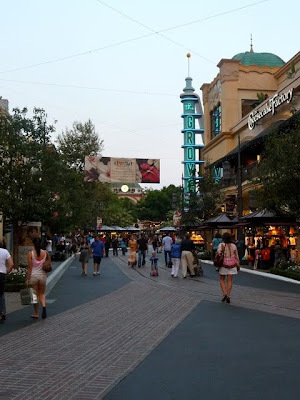 I've always loved visiting the Grove and Farmers Market (I live in LA, so it's pretty convenient). Just a thought, though, The Grove fountain now plays shows every hour, not every half hour. A non-musical fountain pattern runs between shows. One more thing: I like to be lazy and take the trolley from The Grove to Farmers Market. Walking's not my thing.